My home console collection from the last two generations. For the last year or so, I’ve been using a simple strategy to cut down on my backlog and prevent impulse purchases. Every time I want to buy a game, I have to have beaten two others. I started using this system for myself when other backlogs techniques weren’t working. 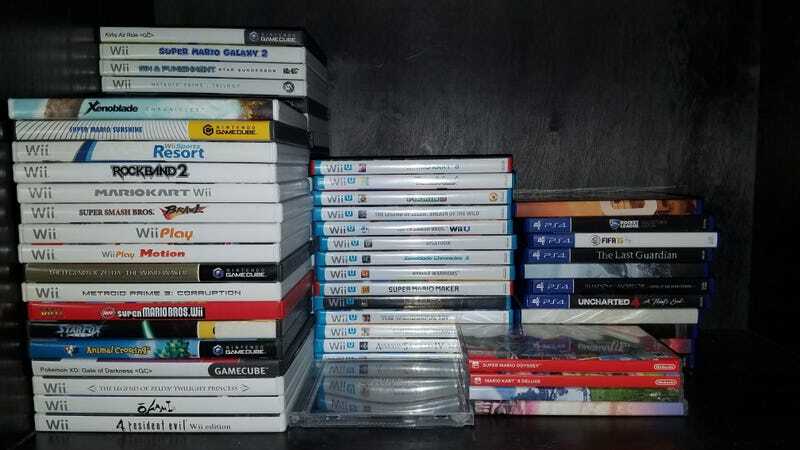 Gamer backlogs are, inherently, a pretty ridiculous first world problem. It’s no shame to not have fully used something you purchased. I’m extremely frugal, however, so it pains me when I purchase (or am gifted) things that go to waste. On my phone I have a running list of games that I’ve beaten and bought since I started this initiative for myself. I also give myself an “allowance.” I’ve beaten eight games since I started and only purchased one, so I have an allowance of three games. See if you can spot the math error! Using this technique, I’ve found myself revisiting a lot of old games that I was partway done with. Personally, I don’t have an issue diving right back into a game that I left unfinished. In fact, people who restart games when they come back to them spook me. How do you get through all the stuff you’ve beaten before? Different strokes, I suppose. Some of the games I’ve revisited were childhood classics. One of the games I beat was Super Mario Sunshine, an all-time great if there ever was one (fight me). My friends and I would play for hours and switch off when we died. Revisiting it and finally finishing it off felt grand. I also took another swing at Mario Galaxy, though I haven’t beaten it quite yet. Other games I took on had sat completely unplayed for years. Kid Icarus: Uprising was a game I got for free from Club Nintendo (RIP) back when it was a worthwhile service. Finally checking it out was a rewarding experience. It made my free game feel “real.” Also, it’s a great game. This technique obviously won’t work for everybody. I have access to a ton of games I’ve purchased in the past. My Backloggery says I own 150, and I’m pretty spotty about adding everything. I don’t count new games I get as gifts as being “bought,” and my brother and I share any new games we get. Purchasing games isn’t something I do that regularly. The rules also get fudged when I buy local multiplayer games, since it can be tough to “beat” those. My PS2 collection, which is largely trash or not beatable in a traditional sense. Two-for-one also discourages purchasing longer games. I love Xenoblade Chronicles and want to keep trying those games out, but formally committing to beating one of them would scare me. It has its flaws, but this system has really helped me. I get distracted when I try to go back and play through older games. Older visuals can be difficult for me to accept. Metroid Prime and Mario Galaxy are both games that I’ve taken years to get partway through. That’s why 2-for-1 works really well for me. At any time, I have several games that I’ve half-beaten laying around. I can beat whatever new game I buy (the only one I’ve bought so far was Superhot) and wrap up an older one (like Crashmo, which I’ve put down for months at a time). Now, I don’t buy games that I don’t think I’ll beat. My Nintendo was offering me a tasty sale on The Legend of Zelda: Oracle of Ages last week, but it’s exactly the type of old game I’ll have trouble pushing through. Superhot, in comparison, has modern visuals and is quick to play through. I’ll likely be buying games like that more and more. If you have trouble with a backlog and find yourself buying games too often, I’d encourage you to try two-for-one. It’ll curb impulse buys and help you realize when you want to own a game more than you want to play it. You might even rediscover a game that you previously left behind.